Are you a creative person? Which talents do you have? Everyone should be interested in themselves because self-recognizing is an important condition for life improvement. Personality tests may help you find out your personality traits and qualities easier. 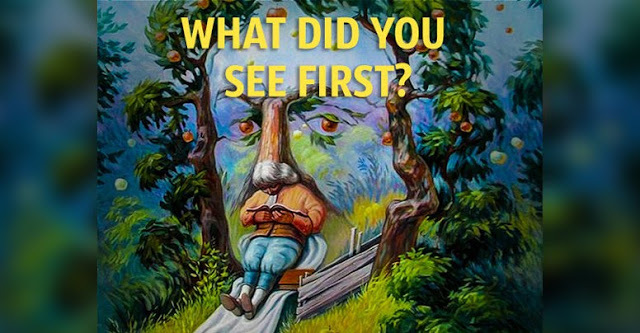 What did you see first looking at this picture? Take a look! What is the first thing your eyes capture? Read below and find out your personality traits based on your choice. If you saw a face with eyes, it means you are a creative personality. It also means you are an art lover and valuer. But usually, you don't notice little details and prefer not to focus on them. If your eyes capture a man sitting beside the tree and reading book that means stable and firm character. You value in people serenity, honesty and humility the most. You prefer small little things which can give you required harmony. If you saw apples at a first sight you are a very hopeful and eager person. It is hard to break your belief. You are flexible and have the ability to adapt to any situation. You can completely value all types of love and relationships.